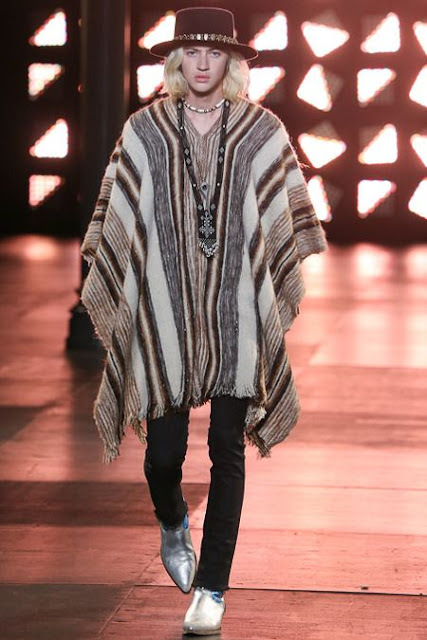 male pattern boldness: Ponchos for Men -- YEA or NAY? 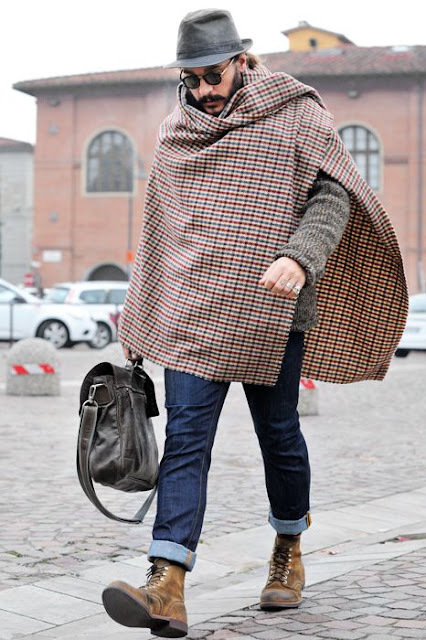 Ponchos for Men -- YEA or NAY? 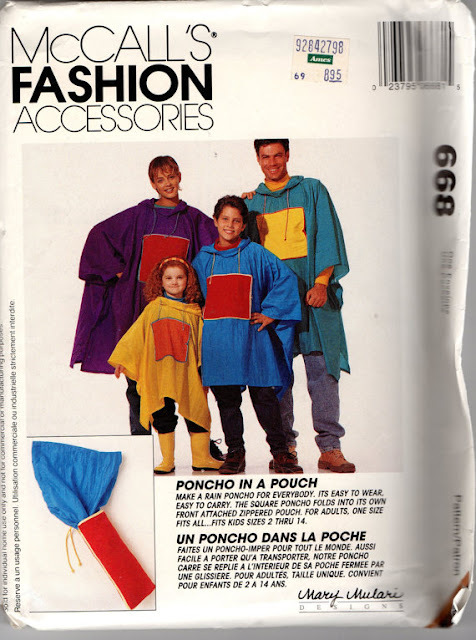 Readers, I have never been a fan of the poncho. I remember ponchos as a 70's fad. 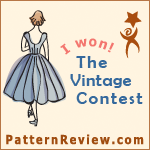 They looked a lot like the patterns below, which, along with Nehru jackets, were about as counterculture as the Big 4 pattern companies ever got. 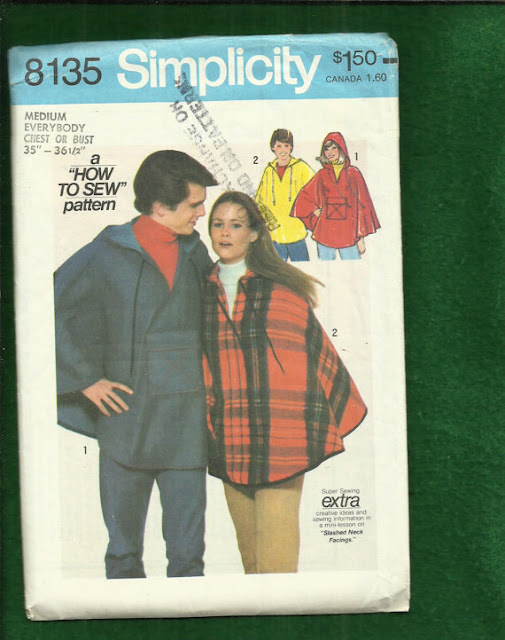 Naturally, given the times, many of these poncho patterns were unisex. In those days, if you really loved each other, you wore the same clothes. Today, ponchos are generally made for rain protection or to stay warm at the stadium: one step up from a Snuggie, but only just. Is that a poncho in your pouch or are you just glad to see me? But wait -- are you sitting down? 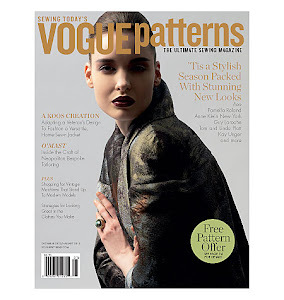 I ask, because it seems that designers are pushing ponchos (and their near-identical cousins, the cape and sofa throw shawl) as fashion once again. Why now, I wonder. Why at all? 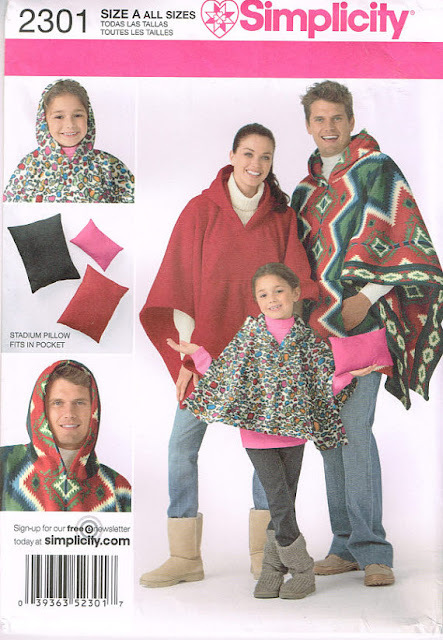 Readers, I ask you: are ponchos to be avoided, or are these fabric hogs something you want to see on the man you love -- or even on yourself? 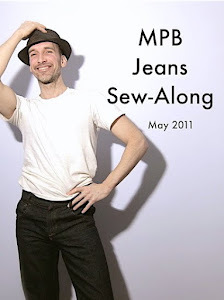 Would you ever sew one? The fellows in the pink/green and orange/grey shawls (?) are looking pretty suave, but overall I have no desire to wear a poncho. That said, to each his or her own, if this look makes someone out there feel happy or comfortable, I'm all for it. Ponchos, YAY!! What a wonderful way to express your individuality--great way to mix fabrics, suede, vintage. I say go for it. Guys in ponchos in the 70s, a) smelled like patchouli and B.O., and b) used their hippie persona to try to get teenagers to take off their clothes. So, no, not feeling it. As for women my age, shorter shoulder poncho/shrugs can actually work pretty well if they're made from pretty sweater knits. "In those days, if you really loved each other, you wore the same clothes." And in the '70s, love meant never having to say you're sorry. Perhaps love really does conquer all, such as the willingness to wear identically ugly outfits in public. "Why now, I wonder. Why at all?" They've run out of ideas. Clint Eastwood looked great in a poncho ("A Fistful of Dollars", etc.) but outside a movie set or the Patagonia, it seems a pointless, desperate attempt to make what is a practical, utilitarian garment into something it isn't. Ponchos serve as bedrolls, blankets, outerwear, horse blankets, and shade. What's next -- Tom Ford's re-imagining of prescription underwear? I like what the man in the last picture is wearing except the sneakers. I liked Luke Skywalker's poncho that he wore in Mos Eisley, too, but generally not a fan of anything that obscures a man's backside. Lately I've been eyeing a pattern for a long, modern take on the classic waistcoat (with velvet lapels, no less). Your comment has me re-thinking it. The poncho does have it's place in western culture south American culture or if you're out in the wilderness hiking, camping or whatever. I can't see myself wearing mine around town. If I'm out on the range in a wind storm or downpour yeah I'll toss it on, you bet! That thing is warm and keeps you dry. Other than that probably not. 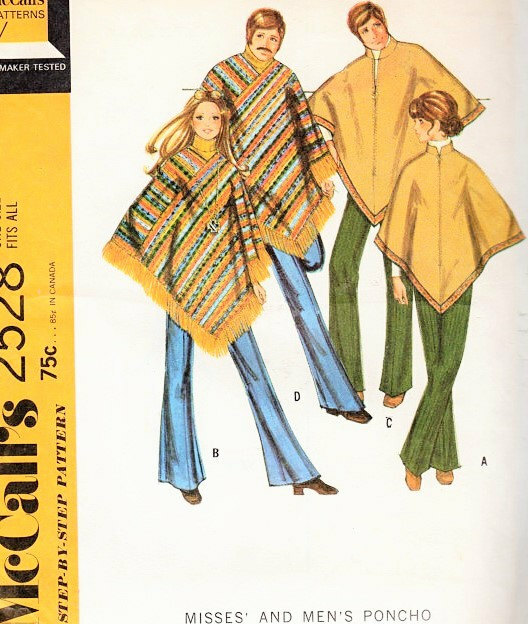 Were I a little more fashion forward, I would be tempted to give a flowing cloak/shawl sort of thing a go (as it is, I do love big scarves), but I have to agree that the classic poncho is just too redolent of the worst of the early '70s to appeal. Now an opera cape in the evening - that's a whole different ball game. Bring it on! I had one in first grade that looked almost exactly like the striped one in McCalls. I loved it so much I wanted to wear it every single day. (Kind of like my brother and his polyester graphic printed shirt with airplanes on it, just a few years later. He hid it in the garage and changed into each morning before walking to school and would change back out of it each afternoon. He wore the same shirt to school every day for a month--my mother was mortified when she found out.) But I digress. He never wore a poncho. Ponchos: I like 'em. I'm not sure they're super flattering on everyone, but they're certainly super comfy. I haven't worn one since the aforementioned one at age 6. But I like them. I don't see them catching on with men. But cell phone guy and patchwork man look pretty good! I have a wool serape from Mexico and I loove it. It is warm and all you have to do is put it over your head. I also knitted a shorter version which is also great. Yes they are fabric hogs, but they are great. For men, not sure. Natives from South American countries do wear them but I have not seen men in these parts wear one recently. You'd have to try one on for yourself to see if it suits you. Great question! You need to listen to last week's Wait Wait Don't Tell Me. 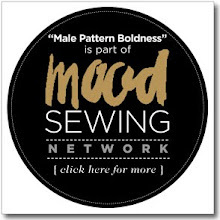 Great riff on Antonio Banderas wanting men to sew their own capes. All through that episode, we just kept shrieking: "Edna says no capes!" It's a work safety issue. I'd probably wear a chic poncho if it was cold enough here in hot, drought-ridden California. I had one in High School (1970's) that I really wanted. Once I had it I realized I looked like a wall of fabric....not so good. :( I say NAY! some are elegant, and some are a red hot mess, like the second to last. Even he looks demoralised by his drooping drab shroud. I love ponchos for me. Never thought about dude ponchos...but I say yes. It's called "blanketing" and it's a thing, I guess. always thought they looked kinda like skirts hanging around your neck. even in the 70's in greenwich village when we all loved each other, i never loved anyone enough to love them in ponchos. nay !! Ponchos no. For men or for women. However, I can't say the same about capes and/or blanket scarves. Those too can be hideous but the right design, worn well by the right person can be great. For example, I really like first picture you posted, of the man with the big scarf and am undecided about a couple of your other examples. I made myself a poncho in 1967, my senior year of high school. It was royal blue vinyl fabric with daisies, had a hood and a quarter zip. 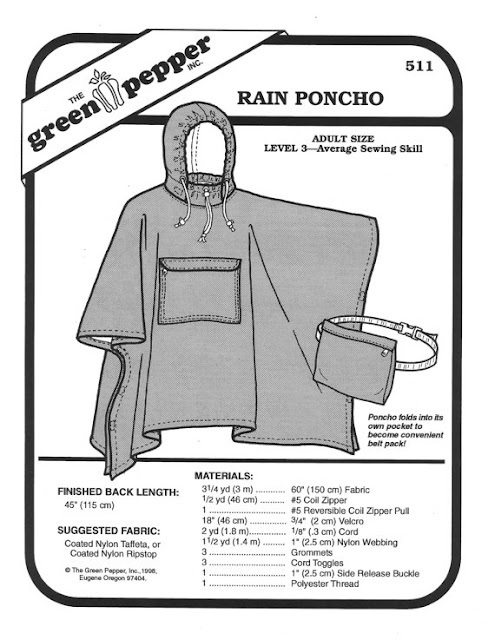 While I kind of wish I still had it for nostalgia purposes (at the time I thought it was way awesome), I say no to ponchos unless you're a sheepherder or (as someone else mentioned) Luke Skywalker. 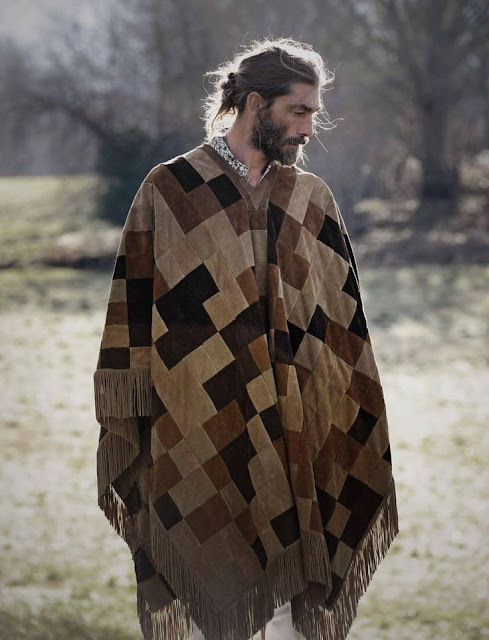 Pretty sure the rise of men wearing ponchos has something to do with the fashion-forward Mr Daryl Dixon of The Walking Dead. I say to Ponchos & Co "maybe". 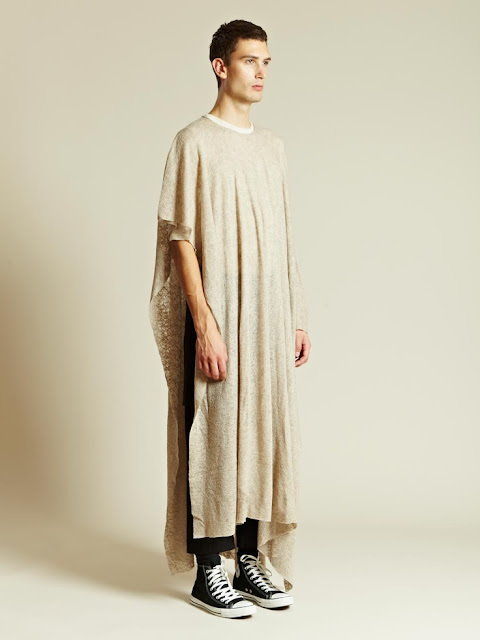 It is a question of a good combination of silhouette of the person and fabric and the proportion of Poncho. Short people that are not skinny usually don't look good. Those guys you show us would look, like you say, even good wearing a tablecloth. One question I have to you. Would you share were you find so nice menswear pics? 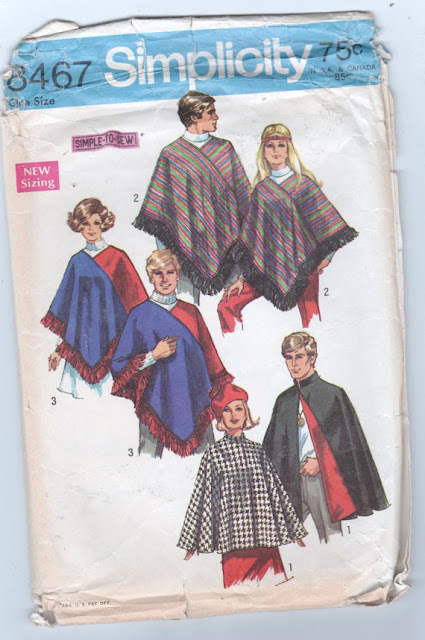 Many of us are clearly conflicted about the various aspects of the poncho or cape, the difference of which I assume is primarily a question of open or closed front, with or without some sort of neck or shoulder fastening (hoods optional in either case). Appropriately designed in fabrics suited for the weather, I would be happy enough to sport one. I would worry a bit about the flowing fabric getting caught in the closing doors of public transportation, but that concern might be more than compensated by the opportunity for DPAs (Discrete Personal Adjustments). You may laugh at those "Doublemint" moments, but how better to prove that you were clever enough to snag a man/woman. And in spite of Peter's delightful, and sure to be often quoted, line about the subject (which itself is a pointed comment on Mid-Century Middle America), styles that are truly unisex are quite useful. We use unisex styles often in our family. We just don't go out of the house at the same time in them. nay..... nay and nay. for anyone. A cape - perhaps - it can be dramatic and striking. Ponchos make me think people are wearing onesies underneath. I think it depends on the person and the fabric. I have one that I made from my handwoven fabric and I love it. The person has to wear it like they mean it for it to look great on them. Exactly! But that's probably the secret for wearing anything: you have to look like you meant it to look like that. Many of the men in those photos seem to pull it off, despite my initial thoughts of "no". However, fourth from the bottom looks lacking of a home, shower, washing machine and hairdresser. Second from the bottom... Did he get kicked out of the choir before they could finish his uniform?! 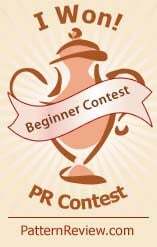 Nay, no, absolutely not - at least for most contemporary real-world applications. To show off a piece of fine fabric when one is walking and not expected to do much, certainly. But I have worn a poncho within recent memory, and I would like to point out that it is virtually impossible to carry a shoulder bag or backpack while wearing one - the fabric bunches up, tangles and looks ridiculous. More, if one lives in a cold climate, the poncho is totally inadequate, because it allows icy winds in at the sides. Still more - once taken off, unlike a shawl, the poncho is a bulky mess that's more difficult to hang up and transport than a coat. 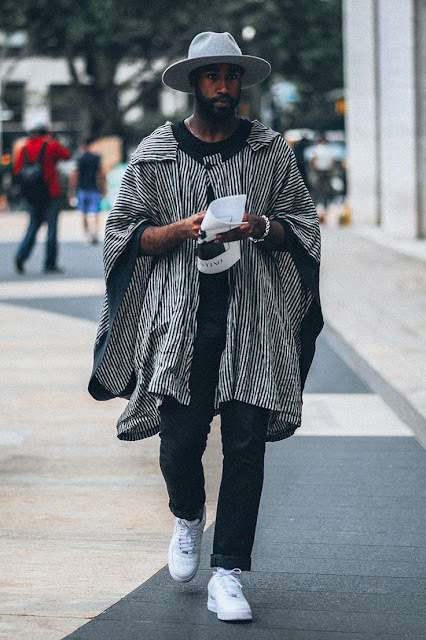 A poncho would be great if you didn't have to carry a bag, or were wearing a waist bag. It would be great if much of your day was spent in a cool but not cold climate riding picturesquely on a fine horse or maybe a handsome camel, and you stored all your clobber in saddlebags. 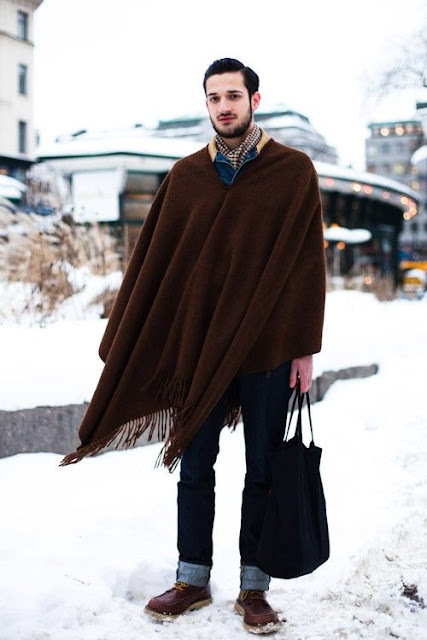 If one is overcome by the urge for a poncho, I suggest a shawl, worn the way many of the men above are wearing them. It's like a poncho, but so much more versatile! Five years from now, you'll look at even the nicest poncho and wonder what you were thinking (at least, unless money is really no object at all). But I've been collecting large scarves since I graduated college in the nineties, and I still wear my old ones. 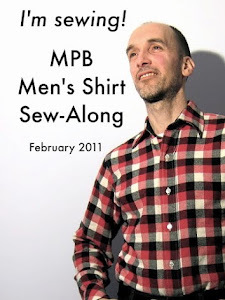 I like the idea of a men's wrap in a great tartan pattern. A wrap is more versatile than a poncho and can be worn in a number of ways, hopefully with panache. guys in those street style pics look extremely good!! nay for pattern ponchos. liking the cape on second one though. I say to each his own. Do I want to see my man wearing a poncho? No. Could other men pull this look off? Sure. Though it makes me feel like a grown man is running around with a security blanket on his shoulders. Also, I feel like ponchos come in for women every few years, and I am just over it. They never seem to go away!!! I still have my '70s poncho in the closet. It is heavy wool, outer-wear weight, and more Clint Eastwood than fashionable. I look like a moving pup tent in it, which I was apparently okay with 40 years ago. 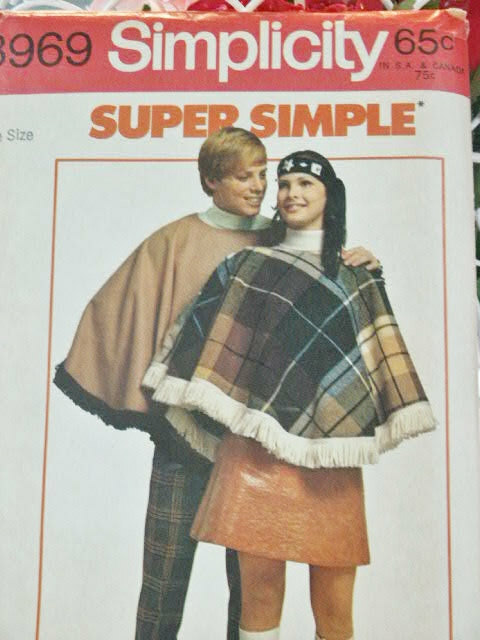 Some of these pictures are serapes, not ponchos. 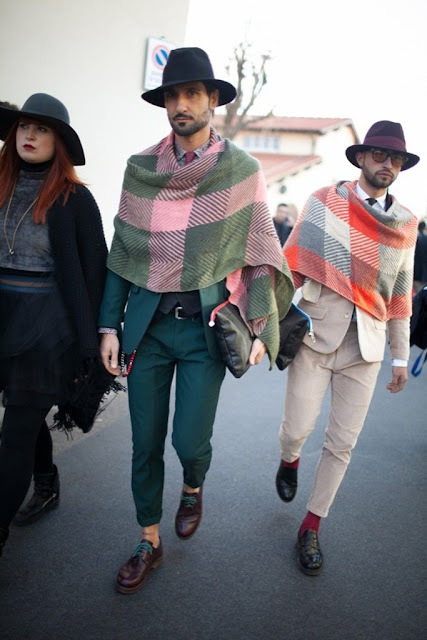 I think a serape is fine and maybe practical in transitional weather - but I'm not a fan of ponchos for men generally. Poncho sounds kind of outdoorsy--horses and wind and stadiums and fending for warmth--but the look depends on how tall and wide the person is. Awkward with seat belts but can be toasty. Carry bags (shoulder & other) under the poncho. Might be most useful when movement is necessary, walking or hiking; not so useful in crowded or auto situations. Versatile for size, useful to keep in a ski lodge perhaps as an auxiliary blanket or coat. But for ordinary street wear, depends on the wearer. Quick to put on and take off! I had a couple when I was a kid in the 70s. Lily (12yo) has two she wears pretty often. And capes. I think someone with round proportions (like me now) risks looking a little like a mountain or, if I was a flaming redhead, Mount Vesuvius in one. Some of these guys carry it off well (and I think a hat finishes the look best) but I don't think anyone could carry off the white knit floor length one. Yikes. That looks like hospital laundry. Ah, serapes! So much cooler to say than "poncho"! I am surprised at the love here. I would have assumed more negative responses (your audience being more hep than hip). So Clint has a serape, but Luke has a poncho? I think large swaths of fabric are "personality driven" fashion statements. You have to be a little larger-than-life/edgier/on-the-fringe (no pun intended) to pull such things off. Anyone else is swallowed up, or simply in a get-up. Ultimately, fashion is your truth that others can see (is that worthy of an acknowledgement, SJ???). Peter you so always make me laugh. But I have to say YEA! HELL YEA for the wrap - the first dude on the phone with "sofa throw" and man bun make dressing look effortless - hot, haute, hot honey.......ok enough. There were some pics that just look downright despicable, or really sofa throw-ish or too girlie or just ugly. The poncho is difficult to wear. The dude with the grey hat - his look is great as well. I know you can carry it off - I believe in you!!!! NAAY!! Unless you are riding a horse!!! I have recollections of visiting Disneyworld on a summer day when the daily cloudburst bit and suddenly there were thousands of festive park-goers in vibrant yellow vinyl poncho with Mickey emblazoned on the side. That is about the limit of a poncho's utility in my view. The last few are fantastic and as a solo poncho (aka only the poncho) wearer myself, their all weather practicality is really top notch, nothing I've tried breaths as well in summer or shields and keeps you warm in winter (given its versatility), style wise....well the last few do it right for men, dark tones, plaids, native paterna to north central and south america, etc all look great on men. Granted it is essentially just clothing yourself in a reall neat blanket, so it is quite easy to make yourself. A little cloth wrap around the waist and it form hugs well if thats your thing, but you can go commando under and enjoy the breeze all day without having to expose anyone else lol. Men's Health and comfort wise A++, Style C- to B- for loose, B- to B+ depending on your body shape for the toght fit using a cloth belt/wrap, Matching a complimentary pattern to your own individual looks can bring this out of the mid grade though, plus a really unique pattern could really wow some. I say wear what make makes you comfortable. I live in Los Angeles, and personally I look around, and see men with the same boulder haircuts, jeans, and t's. I couldn't tell them apart. Be bold. Be independent. Don't pay much mind to what other people think. I wear what I want regardless. I don't believe in trends. Uniformity is boring. Home Again + TWO New Sewing Machines! Say Hello to My New Elna Grasshopper! Back to School -- First Patternmaking Class! Plaid Overcoat Progress + More Pattern Drafting! Peter Models the Plaid Overcoat! And speaking of ponchos...et al.